Continuously evolving food manufacturing techniques combined with consumer preference for fresh food has fueled the demand for sophisticated packaging to meet twin targets of preserving food freshness along with extended shelf life. Whether it is sliced meat, frozen meat, poultry & sea food, vegetable or fruits; Ester offers great "flexible packaging" solutions. 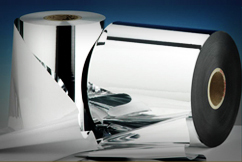 Products on offers include a variety of value added and specialty Polyester Films such as Metallized Ultra High Barrier film (which can even replace aluminum foil), Transparent High Barrier film (a chlorine free solution), Heat Seal (lidding application, with and without anti-fog) & Isotropic film. Our innovative polyester films provide material barrier against moisture & oxygen in a laminate structure which ensures that foods reaching the consumer are as fresh as intended by the manufacturer. Backed by decades of experience in packaging films and a deep understanding of today's evolving FMCG industry, we take on a fresh approach to food packaging by combining our experience with innovation and advanced technology. We enable brand owners and packaging firms to deliver products that meet the diverse needs of today's consumer for fast, fresh and healthy food. All of our films conform to food safety regulations.